While a student at Pinecrest High School, Jamilah Malik-Ismail took classes at Sandhills. 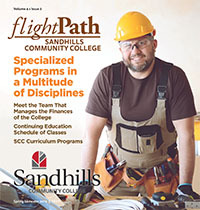 Because of that, she was able to take advantage of two years free tuition at the college through the Sandhills Promise. She was unsure about what she wanted to major in, so coming to Sandhills for her freshman year was ideal. Now she’s working toward an Associates in Arts degree and was selected to be a Student Ambassador. In addition to her studies at Sandhills, Jamilah loves music. She plays guitar, sings, and wants to get involved in theater. She also works at Sandhills Cinema 10. If she looks familiar, you may have seen her before. Jamilah was featured on an SCC billboard during October and November of this year.